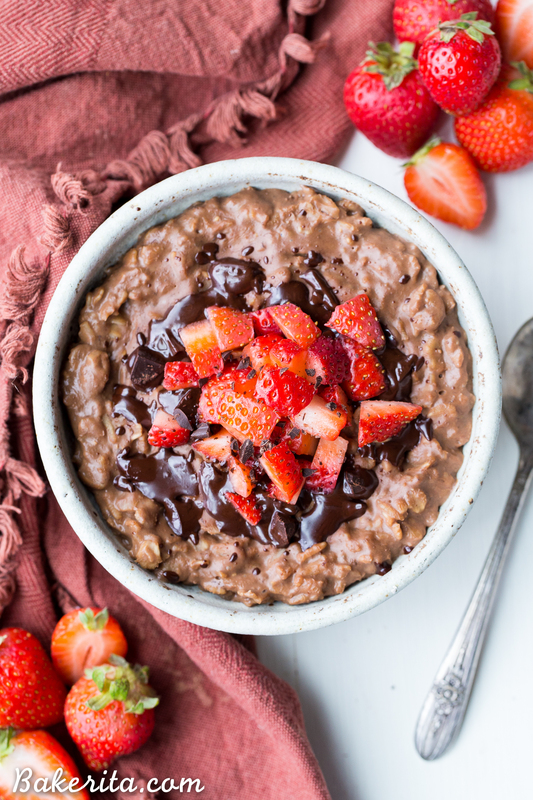 This Chocolate Strawberry Oatmeal tastes like dessert for breakfast, but you can enjoy it guilt-free! This oatmeal is sweetened with just a ripe banana, no added sugar needed. It’s gluten-free, refined sugar free, and vegan. Let’s talk about breakfast. Specifically, let’s talk about that fact that the chocolatey bowl of deliciousness you’re seeing below this sentence? Yeah, you can eat that FOR BREAKFAST. Who’s in? I made this for breakfast for the first time on Monday, again on Tuesday, photographed it (and subsequently devoured) on Wednesday, make it again on Thursday, and then was exceedingly sad on Friday when I was all out of bananas and strawberries. You can say I’m a little obsessed. Typically, I eat yogurt, homemade granola, and berries for breakfast pretty much every single day, but occasionally I switch it up with some oatmeal. I don’t like eggs for breakfast (*gasp* I know), so my options tend to be more limited and skew towards the sweeter side…shocker, right? 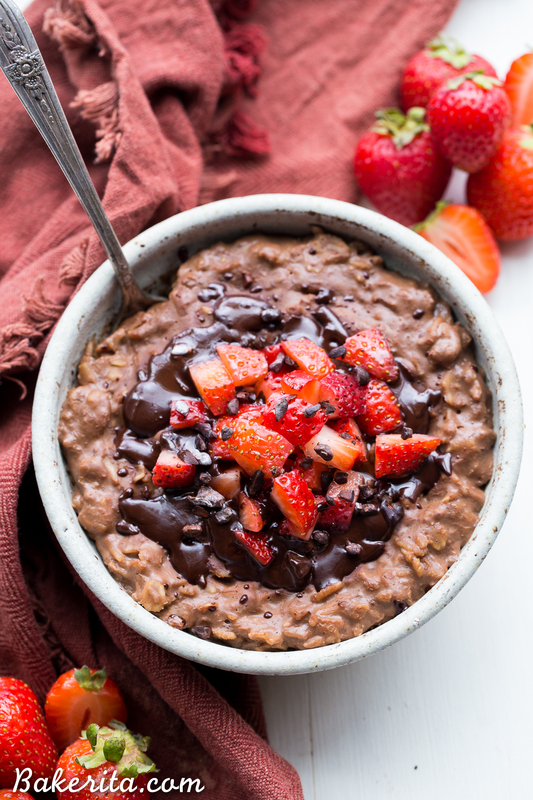 This recipe is a twist on my favorite dessert-for-breakfast oatmeal – chocolate peanut butter oatmeal! I always sweeten my oatmeal with a ripe banana. I can’t bear the thought of putting sugar directly on my breakfast, and the banana always makes it plenty sweet. Not adding any sugar makes this oatmeal refined sugar free! Of course, the chocolate also adds a bit of sweetness, as do the berries, but it’s definitely on the healthier side. Using GF oats and dairy-free milk also makes the recipe totally gluten-free and vegan. When I have them in the house, I sprinkle my paleo chocolate chunks over the top. If I don’t have those around, I sprinkle on a couple mini chocolate chips instead. Makes breakfast taste a little more decadent :D this would still be super chocolatey and delicious even without the extra chocolate on top though – the cocoa adds all the chocolate flavor you need. I’m all about chocolate strawberry everything right now – I think these chocolate covered strawberry chocolate chip cookies started a new obsession! The flavors taste so decadent in oatmeal form and they’re so fun and festive for Valentine’s Day. This would be such a romantic breakfast in bed surprise…wink wink nudge nudge. Your honey would love you for it! 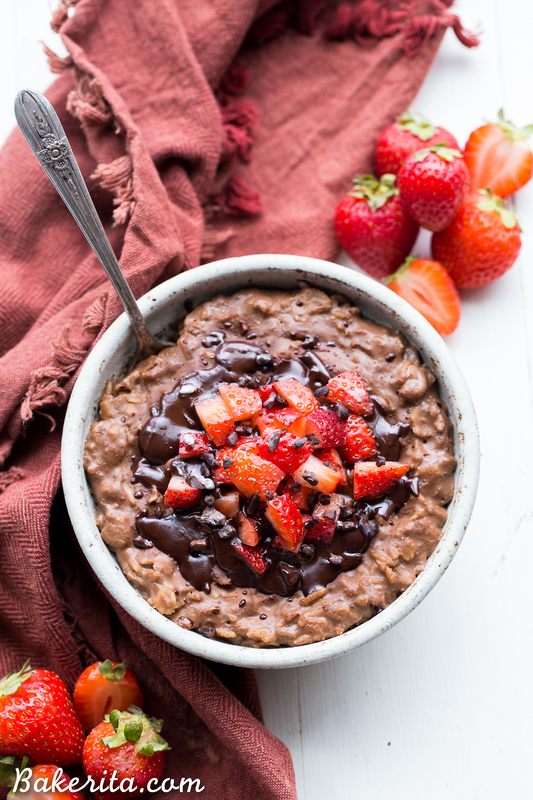 This Chocolate Strawberry Oatmeal tastes like dessert for breakfast! 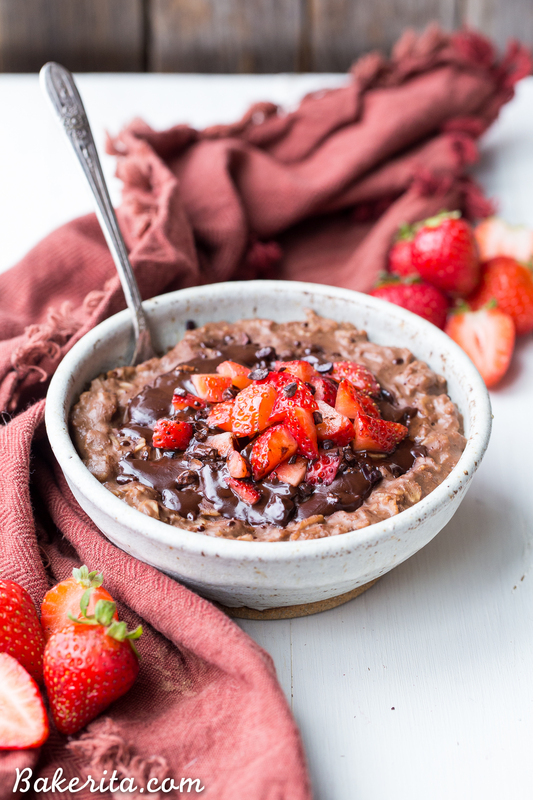 This oatmeal is sweetened with a banana and cocoa powder + chocolate chips make it super chocolatey. It's gluten-free, refined sugar free, and vegan. In a small saucepan, combine oats, mashed banana, almond milk and cocoa powder. Simmer until milk has absorbed into the oats, about 5-8 minutes, stirring occasionally. Place into a bowl and top with chocolate chips and strawberries. Enjoy immediately! Wow this oatmeal looks SO good, Rachel! I wish I could reach through my screen and grab a bowl. I love the chocolate and strawberry combo. This would definitely get me out of bed in the morning! YES you need to try it, Sarah!! Thanks so much, girl. Whoa….chocolate for breakfast! I’m coming to your house! I hope you have a bowl ready for me! Dessert for breakfast is always a win, Rachel! Especially a chocolaty-strawberry bowl of oatmeal! I can totally see why you ate this all week for breakfast! Now THIS is how you start the day! Cheers, doll! Thanks so much, Cheyanne! Happy Monday! I love sweetening my oatmeal with a ripe banana — it’s just perfect! This oatmeal looks seriously delicious and I love that it’s healthy! This is the prettiest oatmeal! I love that I can have this for breakfast every day and not feel guilty! 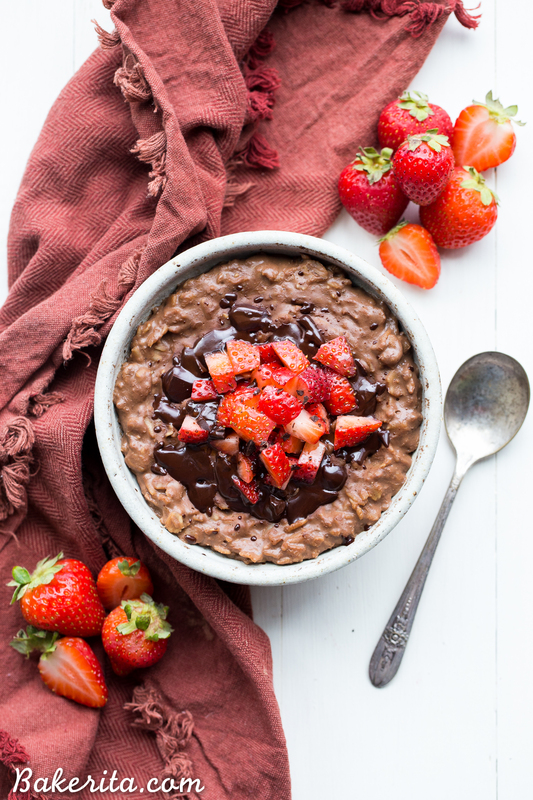 Sweetening oatmeal with banana is the best and you can’t beat the chocolate and strawberry combo! Sometimes when I’m feeling super lazy and I’m craving something sweet I will have oatmeal for supper. Seriously. That’s how obsessed I am. :) This looks like the perfect oatmeal for that. I am totally digging the banana for sweetness. And who doesn’t love chocolate and strawberries? Perfect! You have GOT to try it Erika! I definitely just finished a bowl for lunch…haha. Put that cocoa powder to use :) Thanks girl! Did somebody say dessert for breakfast? This is insane Rachel! It looks absolutely beautiful. This would sure make me spring out of bed – pinned! This looks so insanely good! How have I never put chocolate in my oatmeal?! Trying this immediately! Chocolate oatmeal?!?!? Oh no you didn’t! I’m coming to your house for breakfast! Chocolate for breakfast? I’m in! This looks mouthwatering! I love how you were able to squeeze the chocolate in my still keeping this meal healthy! Oh man, chocolate strawberry goodness for breakfast?! Sign me up! LOVE. Thank you for making chocolate for breakfast acceptable….and beautiful….and delicious… I saw this on IG and it stopped me in my tracks! Wonderful recipe, my friend! Haha it’s definitely good motivation to wake up :) thanks, Beth! I love you for adding chocolate to a bowl of oatmeal, and topping it with strawberries. It will make these long cold mornings worth getting up for. Anytime I can have chocolate for breakfast it is a good day!! This oatmeal sounds and looks fantastic!! This is amazing…chocolate for breakfast!?!?! Yes please!! LOVE having chocolate at breakfast!! So excited that this is a real breakfast, at first site I thought it was a dessert! I have been needing a new pick me up in the AM and I think I found it! Take care. Wow… this oatmeal bowl looks divine, Rachel! I wish I could grab a bowl like this right now ;-) I love the chocolate and strawberry combo. Great way to start a day! ! Can it be made the night before and reheated in the morning? I’ve never had much success reheating oatmeal, but you could try combining the ingredients the night before and making them overnight oats – just put it all in a jar or bowl and refrigerate overnight. I haven’t tried it with this recipe specifically, but it should work! You can warm them up in the morning – you may want to add some extra milk when you reheat them. Hope this helps! Love this recipe. Question though – since it seems you are health-conscious when you eat oatmeal like this for breakfast do you worry about getting some protein in there too? I only ever eat it with protein powder (as a way to sweeten it + get protein in my breakfast) but I feel I would have to eat some sausage on the side of this or something. I’d love to find a high-protein way to eat oats without powder because I go through it too fast and it’s expensive! Hi Ashley! So glad you love this recipe. A lot of times I’ll have an apple sausage on the side for protein, or stir in some Vital Proteins collagen powder for protein. You can also drizzle on nut butters for a protein boost! Ah apple sausage! My boyfriend and I love our local grocery store’s maple apple chicken sausage (fresh from the meat counter) – we buy it regularly! Have you ever tried this in a slow cooker? With a famoly of 5 to feed, that would be a nice way to start the morning, with breakfast ready when you wake up. Mornings can get hectic! Hi Malissa, I haven’t ever tried making these in the slow cooker. I imagine you could find a different slow cooker recipe and just use these ingredients with that method though. You could also make these as a big batch of overnight oats and then just heat in the morning when you’re ready to eat! Absolutely love this recipe (it’s on my need-to-try-list) and your beautiful pictures!! Thanks so much Katja, hope you love it! I have been on such an oatmeal kick this winter. This one’s going to the top of my list! Does it change something to do it the night before? Yes, you wouldn’t want to cook the oats – just combine the mashed banana, oats, almond milk (and probably add an extra 1/4-1/3 cup), and cocoa powder and let it stand in the fridge overnight. Enjoy!